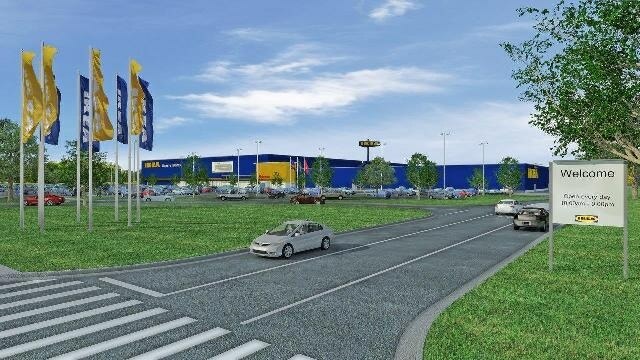 IKEA, the world’s leading home furnishings retailer, today announced plans to install a solar energy system atop its Memphis store opening late Fall 2016. Panel installation will begin this summer, with completion expected in early Fall for what will be the largest rooftop solar array in the State of Tennessee. The 271,000 square-foot future IKEA Memphis, including approximately 800 parking spaces, will be built on 35 acres in the Wolfchase Corridor along the southwestern side of Interstate-40 near the Germantown Parkway exit. Until Fall 2016, Memphis-area customers can shop at the closest IKEA stores: Atlanta, GA; Frisco, TX; or St. Louis, MO; or online at IKEA-USA.com. The store’s 250,675-square-foot solar array will consist of a 1.46 MW system, built with 4,424 panels, and will produce approximately 2,000,000 kWh of electricity annually for the store, the equivalent of reducing 1,406 tons of carbon dioxide (CO2) – equal to the emissions of 297 cars or providing electricity for 205 homes yearly (calculating clean energy equivalents at www.epa.gov/energy/greenhouse-gas-equivalencies-calculator). For the development, design and installation of IKEA Memphis’ customized solar power system, IKEA selected Hannah Solar, an Atlanta-based full service, certified solar integrator dedicated to providing the very best in engineering, products, installation and servicing of solar arrays. Linkous Construction is managing the site work and building of the store that will reflect the same unique architectural design for which IKEA stores are known worldwide. This installation will represent the 44th solar project for IKEA in the United States, contributing to the IKEA solar presence atop nearly 90% of its U.S. locations, with a total generation goal of more than 40 MW. IKEA owns and operates each of its solar PV energy systems atop its buildings – as opposed to a solar lease or PPA (power purchase agreement) – and globally allocated $2.5 billion to invest in renewable energy through 2020, reinforcing its confidence and investment in solar photovoltaic technology. Consistent with the goal of being energy independent by 2020, IKEA has installed more than 700,000 solar panels on buildings across the world and owns approximately 300 wind turbines, including 104 in the U.S.
IKEA, drawing from its Swedish heritage and respect of nature, believes it can do good business while minimizing impacts on the environment. Globally, IKEA evaluates locations regularly for conservation opportunities, integrates innovative materials into product design, works to maintain sustainable resources, and flat-packs goods for efficient distribution. Specific U.S. sustainable efforts include: recycling waste material; incorporating environmental measures into the actual buildings with energy-efficient HVAC and lighting systems, recycled construction materials, skylights in warehouse areas, and water-conserving restrooms; and operationally, eliminating plastic bags from the check-out process, and selling only LED bulbs. IKEA has installed electric vehicle charging stations at 13 stores, with more locations planned.